Just a short drive from Lake Erie’s Long Point a fascinating winery has risen from the ashes of an era when tobacco ruled the local economy. 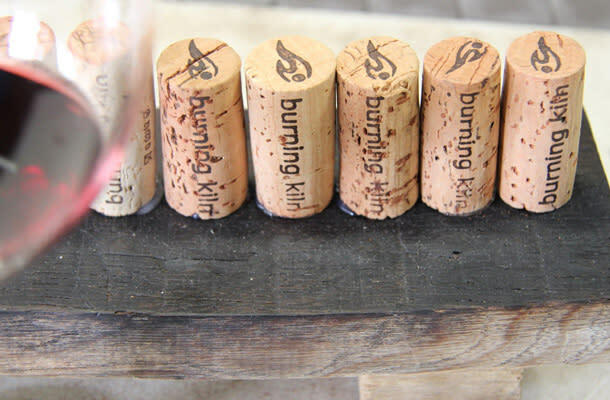 Burning Kiln Winery is making its mark in new frontiers of farming using a former tobacco tract.The winery kiln dries its grapes using repurposed bulk tobacco kilns and offers tastings in a beautifully repurposed tobacco pack barn and light lunches on a patio that boasts a spectacular view of the UNESCO-designated Long Point World Biosphere Reserve. What follows is blogger, Angela Aiello&apos;s account of her trip to visit the winery and surrounding area. As a true Ontario Foodie and Wine Ambassador, it is with great pleasure that I return to Ontario’s Southwest with a focus on exploration and adventure. I was here approximately five years ago and ever since I’ve been hoping to make it back. When it comes to travel I love sharing my experience, and this adventure was no different. So I invited the iYellow team and we took a two-day mid-week trip to learn more about what Ontario’s Southwest has to offer. A short while ago on May 30th, we were able to host many of these talented wineries, breweries and restaurants in Toronto at Wychwood Barns for the City Fare event (and I hope we can do it again every year to come!). So it was with great pleasure we were able to visit them and take our city faces to the country. As a friendly reminder for us all, Ontario’s Southwest is a sub-region of Southern Ontario centred on the city of London. It extends North to South from Lake Huron to the Lake Erie shoreline, and East to South-West roughly from Woodstock to Windsor. Its climate is among the mildest in Canada. Although winter can be severe, summers are hot and humid with a longer growing season than in most of the country, which means good things for us foodies, winos and beer aficionados. Our travels began with a short 1.5-hour drive from downtown Toronto on a Thursday morning. The sun was shining and our moods were bright. To our surprise it actually took far less time than we thought (and to boot the drive was smooth and beautiful!). In no time we were standing on the beach in Port Dover, taking photos of the lighthouse and enjoying the peace and quiet of the sky, sun and water. This beach gets pretty busy in the summer but was pleasantly quiet on our visit. The walk up burger bars look old fashioned, which creates a unique and local flare. After our relaxing walk we headed into town to grab lunch at Schofields Bistro. With a $15 corkage fee we brought in a bottle of VQA bubbly and treated ourselves to lunch with sparkling wine. Two of us had the squash and apple soup with the Lake Erie perch and the other two shared the French onion soup and steak sandwich. We were all very pleased with our dishes and reasonable cost. We even splurged and ordered two desserts to pair with our Burning Kiln late harvested Chenin Blanc. The interior of the restaurant is quaint and comfortable and I would definitely recommend stopping in for a memorable lunch and a game of mini golf to follow. After we filled our bellies with great food we decided to make our way over to Burning Kiln Winery. We pulled in and noticed that we were the only ones there (wine country hint, go to wineries when it’s not prime time for great VIP service). We walked in and sat at the bar and Sharon took great care of us. 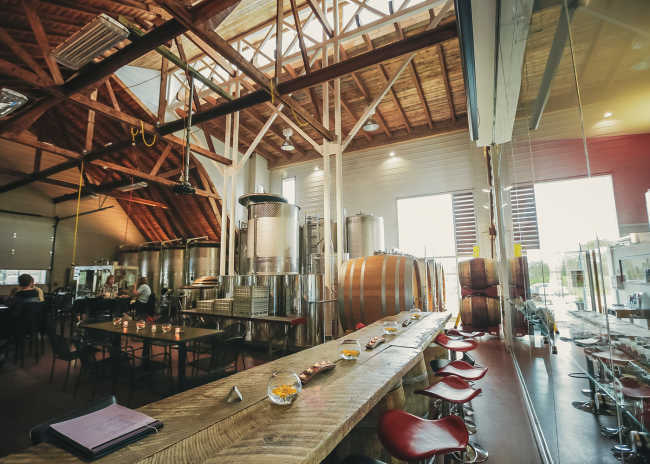 We sipped through their entire portfolio and got educated on the wines of Burning Kiln (luckily we had a head start with our dessert lunch choice). Many of the farmers in Ontario’s Southwest were tobacco farmers when growing tobacco was a good business to be in, but as times changed and tobacco companies wanted lower prices, many farmers changed what they grew to earn more of a living. Grapes (wine) and hops (beer) are now a very popular consumer trend, and farmers have taken notice and are transitioning accordingly. Burning Kiln wanted to keep some of its heritage alive, so they dry their grapes (a process called Appassimento) as a tribute to how they would also dry tobacco in a kiln. There are vintage kilns they still use to dry tobacco, and wineries now place grapes in custom plastic containers and they are placed in the kilns and observed until their time to crush. This process offers a more savoury flavour in the wine. Appassimento style wines are most famously from the Northern areas in Italy, and the most well known is Amarone. Here in Ontario, this innovative process is led by Andrzej Lipinski. Burning Kiln winery opened its doors in 2011 and the winery still hand-picks all of their grapes and hand selects their grape clusters as well. We were lucky enough to be able to see harvest in action. The Winemaker, Luke Orwinski, thieved Chardonnay out of the tank and also let us taste Chardonnay grapes that were currently in the midst of crush. One of the owners, Todd, gave us a VIP tour of the barrel room and told us about the history and stories behind the winery. We all took home a bottle of our favourite wine plus a bottle of their signature wine, Kiln Hanger 2011, which was dried Appasimento style for 2-4 weeks and aged for 31 months in barrel. It is their signature wine and worth the $59.95. We loved our visit so much that we are going to be arranging iYellow tours to this region in 2016! This winery is a must visit in the region, and if you need a place to stay you can glamp and zip line across the road at Long Point Eco-Adventures. After our magical wine adventure we drove over to our beautiful B&B located in Port Rowan called Rowan Nights. We met our lovely hosts, Carolle and Steve, and started to get ready for our dinner reservation at David’s Restaurant. We drove to the restaurant and got a little lost in the country along the way and arrived a bit late, but all was forgiven. The stars were shining and we could hear splashes on the water when we walked down to see the lake and sit on Muskoka chairs to admire the view. Although it was dark, we all imagined how beautiful it looked. We settled into our table, gave Summer (our amazing server) our 4 bottles of wine (here they have $25 corkage) and enjoyed an absolutely incredible dinner of arancini, brie, and fish cakes for appetizers, and then surf and turf and duck for our main courses. We had such a bond with our server that the restaurant crew invited us out for after work beers at the local Norfolk Tavern. We met the locals and took a 35-minute cab back to our B&B. This was one of those nights made for a memory book, an unbelievable night of delicious food, wine and fun. We arrived at our accommodations, reminisced about the evening and our heads hit the pillows at about 4 am. Luckily we awoke to the smell of bacon and coffee at 9:50 am, not that we were hungry at all, but we did have another big day planned! 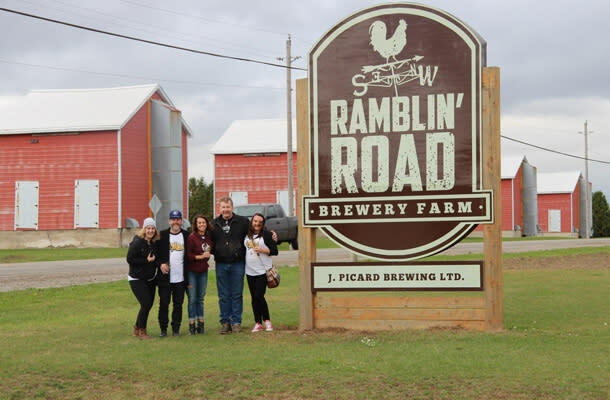 Our hosts happily drove us back to David’s Restaurant to get our car so we could make our way to Ramblin’ Road Brewery Farm. We made a quick stop at Long Point beach and took a group photo. Even though the beach was empty, we were all smiles to see the water, feel the wind and experience the peace once again that Ontario’s Southwest seems to continually offer. 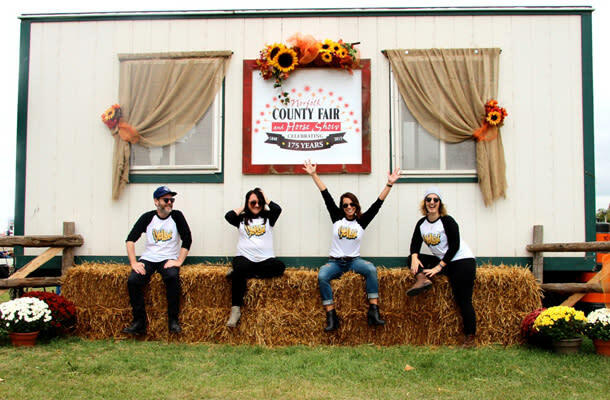 After grabbing some snacks and tasting a few local brews we took off to the Norfolk County Fair. This fair began in 1840, and is older than Canada! This year it celebrated its 175th anniversary and we were lucky enough to experience it. There were rides, corn dogs, carnies and 1st prize pumpkins! It was such an amazing day and all of us had so much fun being kids, laughing and digging into the fair food. All in all, this two-day adventure was a truly unforgettable memory for all of us, and we absolutely loved every part of it! We would highly recommend our above experiences and can’t wait to bring our 20,000 iYellow members to the region to celebrate and learn more! Angela Aiello is the Founder & Creative Director of iYellow Wine Club, a Toronto-based social club that offers its over 20,000 members a place to drink and learn about wine through regular events, classes and tours.